There has been considerable discussion on this website about the use of animal studies to develop new medical treatments. But some animal-derived products such as antibodies also play a crucial role in diagnostic tests for some diseases and targeted treatments for others. In the last week, antibodies hit the front pages of newspapers and websites with the news that the ZMapp serum given to 2 Americans aid workers stricken with the deadly Ebola virus was a cocktail of antibodies. Developed through research in mice, the two components of this experimental serum – ZMab and MB-003 – had only previously been tried in monkeys, but the results were very promising. As of this writing, both aid workers’ conditions had improved. Mice played a critical role in developing the antibodies used to treat aid workers with Ebola. Tweet this! Tests to look for heart proteins in the blood such as troponin that indicate that a heart attack has occurred. Tests for the presence of the HIV (AIDS) virus in the blood. Tests for proteins present in the blood of patients with Lupus, an autoimmune disease where the immune system attacks the body’s own tissues. 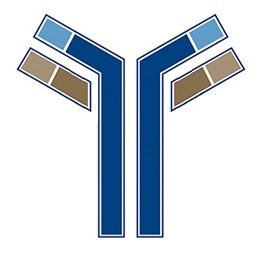 A diagram showing the characteristic Y shape of an antibody molecule. It is able to grab two of its target molecules with the ends of the two arms of the Y.
Antibodies can also be used to treat disease. Certain antibodies can neutralize toxins such as snake venom. Other antibodies are coupled to a toxin or other chemical, such that it is delivered only to cells carrying the protein that antibody recognizes. 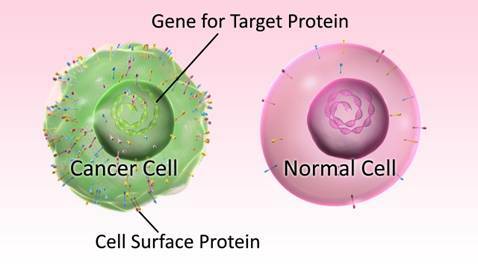 For example, some cancer cells generate unique proteins so antibody-coupled drugs can be used to deliver a toxic agent to the cancer cells without harming other cells in the body. Antibody therapies have been effective in treating a number of types of cancer, including Hodgkin lymphoma and non-Hodgkin lymphoma, some forms of skin cancer, and some forms of breast cancer. Now we learn that antibodies may also be effective in treating Ebola. Unique cell surface proteins on a cancer cell, which can be detected using antibodies. There are two types of antibodies used for medical diagnostics and treatments: polyclonal antibodies and monoclonal antibodies. Both require animals in their production. Polyclonal antibodies are produced by injecting the protein of interest (or part of it, called an antigen) into an animal. Since this is a foreign substance, the animal’s immune system reacts to it by generating antibodies to fight off the intruder. Later, samples of the animal’s blood are removed and the antibodies isolated. 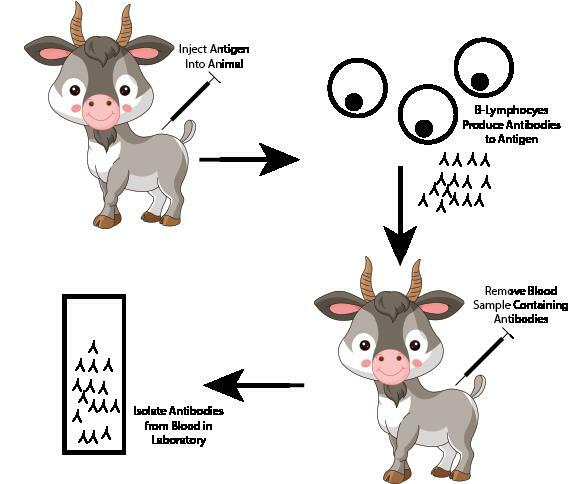 Larger animals such as sheep, goats, and rabbits are often used for antibody production because they have enough blood in their bodies that large blood samples can be removed without harming them. Antibodies generated using this method are called “polyclonal,” because they came from many different immune cells known as B cells or B-lymphocytes. 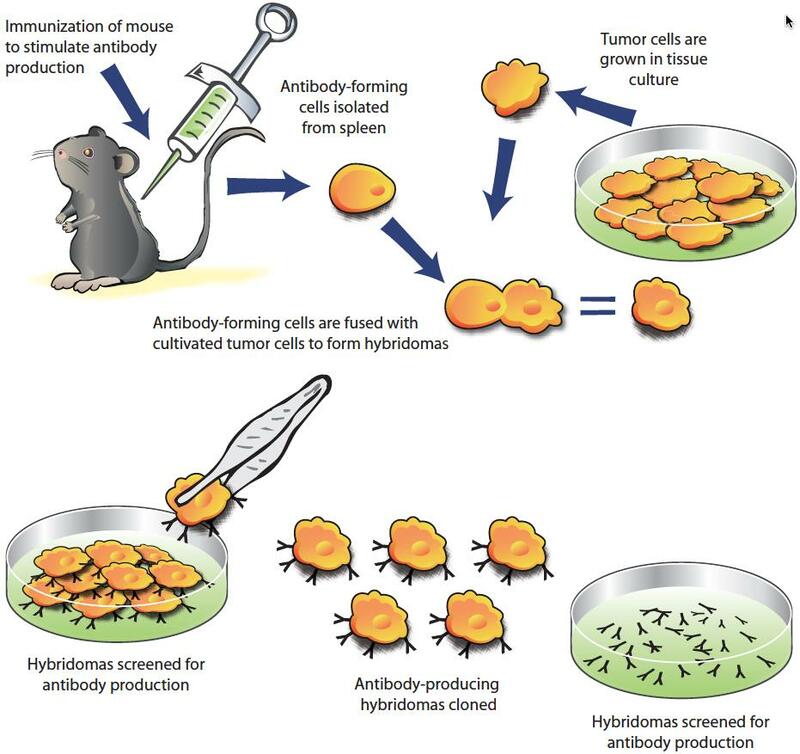 To produce monoclonal antibodies, an animal (often a mouse) is injected with the partial protein or antigen of interest. Antibody-producing cells are later isolated from the animal, often from its spleen. Fast-growing but harmless tumor cells are cultivated in the lab and fused with the isolated antibody-producing cells. This produces a new cell type called a hybridoma that can be grown in the lab. Once it is confirmed that the hybridomas are generating antibodies against the right antigen, these hybrid cells can serve as factories to grow large numbers of pure monoclonal antibodies in the lab. Posted on August 7, 2014 August 8, 2014 by EditorPosted in News, Science NewsTagged animal testing, antibodies, cancer cells, monoclonal antibodies., polyclonal antibodies, pregnancy tests.